a) Position your cases and displays in a manner that is eye-catching for shoppers to stop, look, and try on jewelry. b) Place mirrors on the back of shelves or tables to make the jewelry sparkle and shine. 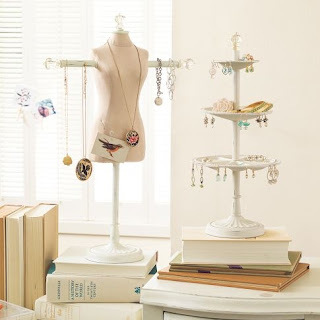 c) Place tall display aids such as earring display stands and necklace displays toward the back of the table or case and place medium displays such as bracelets and watches toward the front. Ring trays and flat trays should be in the very front to optimize visibility. d) Group jewelry by color or style. Place items that go together in close vicinity to each other. For example, if you display loose pendants, position chains nearby. Place high-value items in locked display cases. e) Place items on an angle for full visibility and don’t position jewelry items so close to each other that they lose their unique individual appeal. f) Position display lighting in the cases or on the tables in such a way that key pieces are well-lit with residual light reflecting off of other adjacent pieces. Miniature track lighting works well for this purpose. 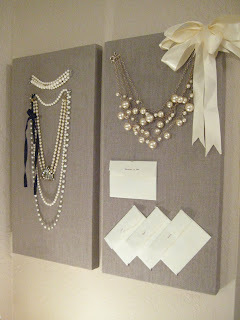 g) Add finishing touches to make the jewelry display visually appealing. Ideas include weaving tulle fabric among the displays, scattering flat-backed glass marbles in the case or placing floral accents at the base of necklace display stands. We love the look of linen displays and think it's suitable for multiple types of jewelry displays in various shops and boutiques. Storeowners know how important it is to create a stunning jewelry display in the store’s window area. The more creative it is, the more that it will get noticed by passers-by. Creating a visual display for the goods that are being sold in the store is important as this will pique the interest of the customers. It is this interest among those that pass by the store that will play the big role in enticing people to check out the items that you have inside the store. This is one reason why creating interesting store displays is something that storeowners should not take for granted. Those in the retail business know how important this is in attracting potential customers. This is where the bulk of the business comes from. True that there are those who are considered to be loyal customers but it is these accidental buyers or those that purchased something on a whim after seeing the display window is what is important to storeowners. The store's window display creates the curiosity that needs to be stirred in a customer who walks by the store. This will play a big role in the store's success especially when the competition to attract the customers is high. But of course, one should not forget the store’s interiors as well as the layout of the displays inside as this is what will compose the shopping experience of customer. The store’s display is really important if they want to attract more buyers and increase their sales. Those that are in the retail business can attest to this. It does not matter what items one is selling because as long as there is a tangible product that is being sold, then it should be displayed and highlighted properly. It also does not matter with the size of the store, as visual merchandising is important if you want to attract buyers. This is one way to pique the interest of potential buyers and customers. Jewelry stores for that matter rely a lot on visual merchandising to make a sale. Be it a store in a mall or a booth in a trade or bridal fair. The hard part for the business of selling jewelry is that it is not everyday that they are able to hit their sales targets. The reason for this is that jewelry is not considered to be a priority in one’s budget. Lucky are those stores that already have a network of regular customers who always inquire for new stocks as they consider this as an investment. However, not all stores are lucky to have that so the next best thing to do is to be able to get the attention of potential customers and passers-by with their jewelry display. Making use of jewelry display cases is necessary as this is where the items will be laid out for display. In this manner, you are assured that the customers can easily see the items without worrying about the security of the items. Nile Corporation is one source of display cases that you can check out online. The various items that they have can help you plan out what kind of cases you would need for your store if you still don’t have one. Jewelry is what most women consider as an important part of their fashion arsenal. You can bet on it that women have at least one pair or earrings, a ring and a necklace tucked somewhere in their closet. It is one accessory that you can use to easily complete the look of the outfit. Wearing the right pieces will surely make one look stunning and classy without going overboard on an outfit. A pair of earrings is a versatile accessory to have. It has been used for centuries as an adornment to the body. Earring display stands and racks are common in all cultures because even men of local tribes also use it. Your everyday outfit can look more fabulous with a pair of earrings. Of course, it is best to match it up with your day-to-day outfit. If there is one accessory that you should not forget wearing, it should be your pair of earrings. If you want to go for the simple style and quiet elegance, then a pair of stud earrings is the best thing to get. If you want to stand out and be notice, novelty earrings should be your choice of earring display. Affordable – Novelty earrings, especially those made of plastic and other materials are considered to be affordable compared to buying those that are made of precious metals and studded with precious stones. You can already purchase a lot of novelty earrings for the price of one pair of gold or silver hoops. Texture and Substance – the great thing about novelty earrings is that there are different materials that can be used to make it. Beads, feathers, glass, shells and other substances aside from precious metals and stones are usually used to create this wonderful works of art. Using these novelty items can add pizzazz to your otherwise plain looking outfit. Also, the designs are unique thus making the wearer stand out among the crowd. Work of art – the great thing about novelty earrings is that the designs are unique and different. It depends on the materials that are used. Makers of these novelty earrings can be considered artisans as they see how best to combine different materials to make a pair of earrings that is worth purchasing. Unique – These kinds of earrings are unique in their own way. Starting with the material used to make it, which is already unique on its own. The method used to combine the materials together is another craft that should be highlighted. There are other ways of making jewelry and the creativity of the artist shines through with the way these materials are combined and put together. Novelty earrings are a work of art if you look at it. The unique designs make it really wonderful to use as you can stand out with the unusual material and design. You can even consider your earring display as worksof art that you can place in your room. A lot of people consider buying jewelry as an investment. Since most jewelry is made of gold or set in other precious metals like platinum and silver, this makes it a good investment if you want to start saving up in a different way. The only setback would be if the cost of the metal suddenly goes down because of a low demand in the market. However, this fact should not discourage you from investing on jewelry because over time, it does appreciate its value especially when you chance on a really exquisite piece. The craftsmanship is also of great importance because this is what will give the jewelry value, aside from the metal and stones that makes it up. Because of this, one should learn how to take care of their jewelry pieces. Proper care should be the order of business if you want to conserve the value of the piece. Of course, one cannot help for the piece to get scratched or the color differ because of long term use however, there are steps that you can do so that you will be able be bring back the glorious sparkle and shine of the important jewelry piece. The piece that is most fragile are dangling earrings. The wire used on this kind of pair is usually lightweight and really thin. The reason for this is so that it can be placed on and taken off easily without any hassles on the part of the wearer. The wire used is fragile, thin, soft and can break off easily if not handled with care. In order to avoid it from getting ruined, you can use an earring rack or a revolving jewelry display case where you can hang the precious things. This way, you are sure that the pair is always together and that the components of the earrings will remain as is during the time of the purchase. There are cases that are purposely made as an earring display. This is great for those who want their pieces be placed in separate boxes for easy storage. If you have a set of pearl earrings, it is important to take care of them, especially the pearls. Paying special attention to these babies will surely do you good because it will ensure that you would be able to retain its original luster. Pearls are more fragile than gemstones so one should treat them differently. Rough handling and improper cleaning of the pearl pieces can easily damage your precious possession. It is best to avoid spraying perfume; hairspray and body oils to your pearls as this can damage the coating and its natural protection. It is better to do all your beauty rituals first before putting them on and this pair should be the first thing you remove and placed on your earring display case. For those that have earrings with precious stones, it is best to keep them inside pouches after using so that you would avoid it from getting scratched. In order to retain its shine and luster it is recommended that you have them cleaned professionally at least once a year. These experts would know how to best protect and prolong the life of your precious investments. Taking care of your earrings would ensure that your children and grandchildren will be able to appreciate the investment you did during your younger years. Jewelry is one thing that most women consider to be an important part of their fashion arsenal. It is the ultimate accessory that one can use to complete the look of the outfit. Wearing the right pieces will surely make one look stunning without being overly made up. Of course, the way to do this is to not wear it too much as this will also ruin your look and what would have been a rather nice looking outfit. Pairing your jewelry with the occasion that you will be going to is the way to go if you want to look great and not overdressed. For casual occasions like going to the mall or doing some groceries, a simple jeans and shirt outfit would look fabulous when worn with a pair of hoop earrings. This kind of earring is available in various sizes compared to others whose size is quite limited. When purchasing your first set of hoops, it is best to try it on so that you would know which size you are most comfortable with. Petite hoop earrings with minimal embellishments are best for casual outfits. For more formal outfits, you can choose those that are studded with precious stones like diamonds or emeralds. Most stores use this kind of pair for their jewelry display boxes when attracting customers. Stud earrings are also great for casual occasions. It can help add oomph to an otherwise boring and plain outfit. This kind of pair can also be worn even on formal occasions. It is one of the most sought after designs because of its versatility. Casual outfits would be complemented with simple diamond stud earrings and more formal dresses would look even classier with a pair of pearl stud earrings. It is best to place them back on earring display cases after using them on a night out to protect them from getting scratched or damaged. Drop earrings or dangling earrings are great for formal occasions, especially those that are studded with precious stones. This pair of earrings would make you look even more stunning especially when you wear it with a long gown that would show off the exquisite workmanship of the piece. There are other designs for drop earrings that would be appropriate even for office wear. This will make your office attire look classy without going overboard on the jewelry. However, if you plan to wear this kind of pair to the office, make sure that the length would not be too long otherwise, it might ruin your whole look by making you look like you are overdressed for a day in the office. If you want, the option would be to wear a pair of studded earrings. Even if the pair has stones on it, it would not be over the top because the setting is right close to your ear. Now, one can choose not to wear expensive jewelry all the time. You can save the real ones for special occasions. Your everyday jewelry can that be considered as fashion jewelry, which are mostly imitation including the stones and the metal used. To protect the colors and coatings of this kind of jewelry, you can place them on earring display racks or other kind of protective cases to make them last long. When wearing earrings, just remember that less is always more.